Stanford researchers Beth Pruitt and Alexandre Ribeiro have discovered that a heart cell matured from stem cells in the lab looks and behaves like a normal adult heart cell when grown in a long, thin shape and on a surface that provides some tension. The heart is never quite at rest, and it turns out that even in a lab heart cells need a little of that tension. Without something to pull against, heart cells grown from stem cells in a lab dish fail to develop normally. In addition to discovering the important role that tension plays in growing heart cells outside of the body, Stanford engineers have found that lab-grown heart cells contract more strongly when grown in long, thin shapes. Beth Pruitt, an associate professor of mechanical engineering and senior author on the study, said that stem cells have held promise as a source of human heart cells, and for almost a decade scientists have been able to grow them into beating structures in the lab. “But getting them to look like normal human adult heart muscle cells has been difficult,” she said. These findings are also important for scientists who have hoped to use human heart cells as a way of testing drugs for side effects before they are prescribed to people. Drugs are traditionally tested in animal heart cells, but given the many differences between humans and animals, those cells don’t always detect drugs that could damage human hearts. Pruitt and postdoctoral scholar Alexandre Ribeiro reported the biomechanical conditions for producing normal adult heart cells in the lab in the September 28 Proceedings of the National Academy of Sciences, along with colleagues at the University of California, San Francisco, and the Gladstone Institutes. Within the heart, muscle cells are long and thin, intertwining to spread signals and beat in rhythm. In the lab, heart cells take on a variety of shapes depending on the conditions in which they are grown. The cells fail to form the kinds of internal structures of normal heart cells, and although they do beat, they don’t hold a steady rhythm. “We jokingly call those ‘arrhythmia in a dish,'” said Pruitt. Pruitt and her colleagues at the Stanford University School of Medicine began working on the problem of how to develop more normal looking heart cells through a Stanford Bio-X grant in 2010. At the time, their goal was to find ways of probing the mechanics of normal heart cell contraction. They were laying the cells on lab dishes covered in tiny posts, then measuring how much force the cells put on those posts. “One thing we learned from that work is that cells don’t stick where you want them to,” Pruitt said. They did manage to grow some cells that looked more normal than the usual beating blobs, but they didn’t look like adult heart cells and produced much lower force. From that beginning, the team went on to develop better mechanical techniques that allowed them to measure force without the posts. In his work, Ribeiro matured stem cells into heart cells. He then forced those cells to take on a variety of shapes by putting them on lab dishes containing defined shapes of a material that the cells are able to stick to. Those shapes ranged from a square to rectangles of various dimensions. 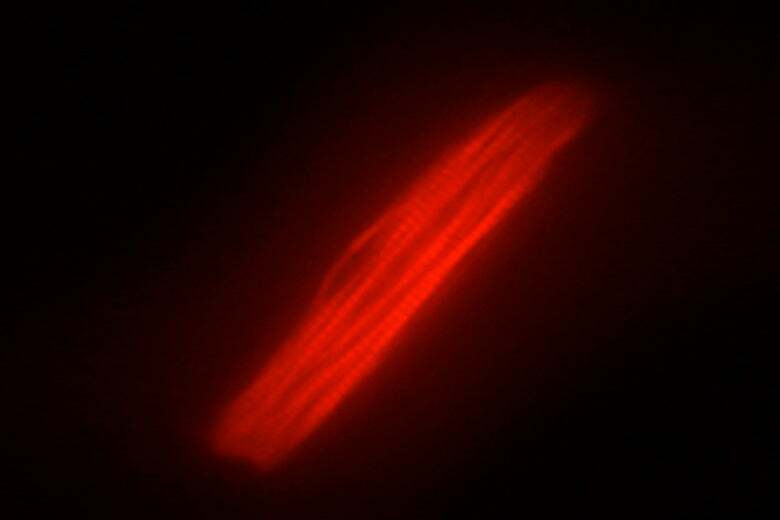 Ribeiro found that as the rectangle grew longer and narrower, the structures within the cells began to look more like a normal heart muscle, with the long contractile fibers within the cell nicely lined up. The cells also beat more forcefully. In addition to tweaking the cell shape, Ribeiro grew the cells on three biomaterials that were under different degrees of tension. One surface mimicked the looser tension of the developing heart, another was the tension of the normal heart and the third mimicked a stiff, diseased heart. The cells looked more normal and contracted most forcefully under the Goldilocks tension of the normal heart, he said. Anything looser and the cells didn’t develop normally. These also contracted less forcefully, and the internal fibers buckled and bent between contractions. On firmer materials, cells contracted less forcefully and the fibers sometimes ruptured when trying to contract. Ribeiro said that in addition to providing a better source of cells for drug testing, their technique includes a way of visually detecting when cells are contracting properly. Until now, the gold standard for measuring contraction has involved painstakingly attaching small electrodes to the animal cell. “We hope this can be a drop-in replacement for animal cells, and potentially instead of having to do individual recordings from each cell we could use video analysis,” Ribeiro said. Visual analysis would make it significantly easier to test drugs on large numbers of cells. The team was working with stem cells that were derived from human tissues such as skin, also called induced pluripotent stem cells or iPS cells. One advantage of working with these cells, beyond their ability to form new tissues, is the fact that scientists can sequence the DNA of the person who donated that tissue sample and look for mutations that are known to be associated with heart disease. This step allows scientists to test drugs only on cells generated from people with no predisposition to heart disease, or to induce specific mutations to see how they predispose the cells to disease. “Conversely, you could also say, ‘One in 500 people have a mutation that causes heart disease so we should test drugs on that population as well,'” Pruitt said. Pruitt’s colleagues at the Gladstone Institutes have been creating iPS cells from people with a variety of known mutations. “It gives us the potential to test drugs almost on an individual level,” she said. This study was supported by the American Heart Association, the National Science Foundation and the National Institutes of Health, and through seed grants from the Stanford Cardiovascular Institute and Bio-X.